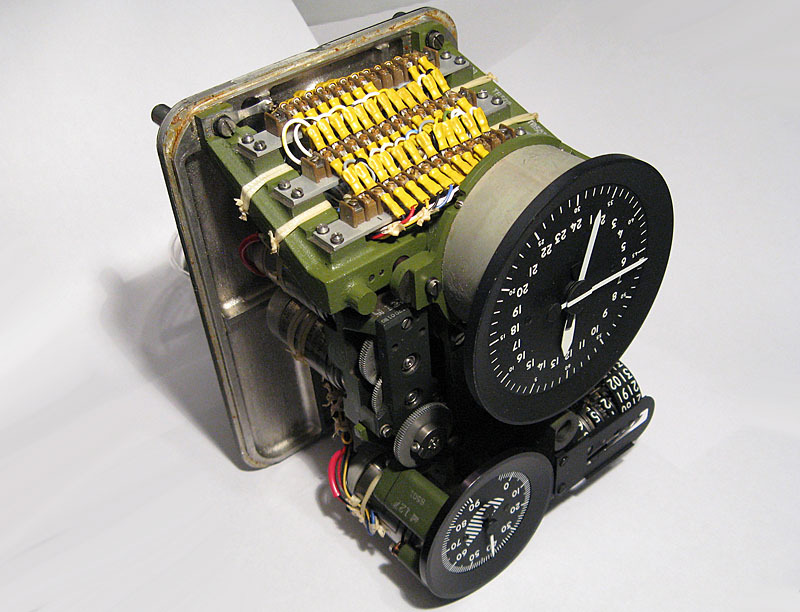 This unusual device is the clock out of a MD-1 Astro Navigation system, which was the navigation system used on B-52 bombers prior to the invention of inertial guidance systems. Sometimes called the Star Tracker system, this complicated device made use of an electromechanical sextant mounted to the top of the aircraft, linked to an array of controls and computer modules. When in operation the Astro Navigation system would track the positions of up to three stars (or the Sun), and calculate the aircraft's current position. This clock is powered by a 28 volt, 400hz synchronous motor which also serves as the device's timebase. 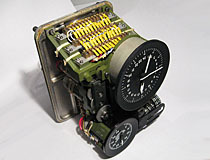 The clock contains no external setting controls, but a complicated system of synchro transmitters and synchronous motors allow the clock to be set and read by the star tracker system. In normal operation this clock would have been sealed in an airtight gas filled enclosure, and a valve stem has been attached to the back panel of the clock to allow filling and removal of gas after the case is sealed. When first released, the clock in the MD-1 Astro Navigation system was notoriously inaccurate. This was solved in later versions by the addition of a new tuning fork timebase, which supplied a clean 400Hz signal to the clock's synchronous motor. B52 MD-1 Astro Navigation aircraft clock.